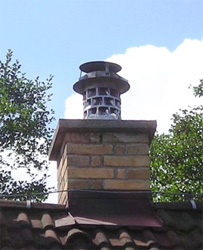 The chimney capital can be applied to advantage for resolving problems of chimney heads situated closed to the outer walls, far away from the crest, nearby higher houses, or trees and at low objects where the chimney requires, due to the particular application, certain height, markedly dominating above the building. It is suitable for exhausting of exhaust gases from all types of facilities. Good resistance to humidity enabling dry, as well as wet facility operation. It is applicable both for new buildings and for reconstructions. All chimney capital is made out of stainless steel! Improves combustion quality that supports considerable economy - fossil, fuel, as well as gas fuel savings. The course of combustion of all fuel types is stabilized. Limits emissions of solids and fly ashes into air. Stretches out the chimney service life. Suitable for all chimney, stoves and boiler types and served to all types of exhaust devices. Prevents wind impact to the chimney draught and blowing out ignition flame of flow heaters and central heating boilers. Very distinctly limits external impacts to the chimney drought. Fast and simple mounting is much advantageous as everyone can make it in line with the respective manual. High system stability is guaranteed if the chimney head is properly adapted and the chimney capital is correctly mounted up. The capital does not consist of any moving elements that could be easy damaged. The capital limits erosive impact of water in the chimney system. The chimney capital need not replacing if the fuel type is changed.